These guys are the 2017 Roy’s Bait and Tackle Pro Staff, and they are here if you have any questions or need some guidance. Tod Johnson has been fishing from the time he could walk, and kayaking since 2009. He began paddling the Texas Gulf Coast to expand his fishing options, while at the same time finding peace and solitude in time spent on the water. He made the leap in 2013 from inshore to offshore fishing where he fell in love with the salt spray, screaming drags, and a family of like minded offshore anglers. Through it all, Tod has always been a customer and a friend of Roy’s Bait & Tackle Outfitters. Tod’s passion for offshore kayaking drove his decision in early 2016 to relocate from San Antonio to Corpus Christi, TX. Tod now travels from Tournaments to Kayak related events capturing and sharing the amazing culture that surrounds the Kayak Industry. He contributes to local and national publications such as Coastal Angler Magazine, Saltwater Angler Magazine, Fishbrain Weekly Fishing Report, and Lone Star Outdoor News. You can also find Tod on Instagram under the handle @SAHunter_Outdoors. 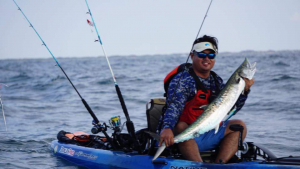 Tod continues to compete in Local and National offshore kayak fishing events such as the Extreme Kayak Fishing Tournament Series, and the Blue Water Kayak Classic. He currently is on the rules and ethics committee for Extreme, and has recently become part owner of the Texas Blue Water Kayak Classic. Tod intends to help build Texas BWKC into the premier Texas Offshore Kayaking event. 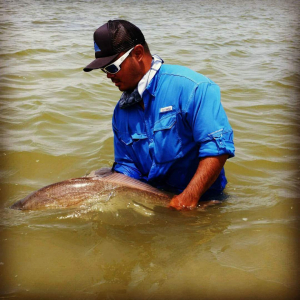 Mike was born and raised in Corpus Christi, and grew up fishing inshore in the Oso Bay and lower Laguna Madre waters. His passion has always been slow drifting the flats, fishing topwater and artificials hunting for trout and redfish. As he became a more confident angler, Mike was slowly drawn into the ocean. Mike remembers seeing others catching sharks, kingfish, cobia and even tarpon off of our local Bob Hall pier. That’s when he realized he wanted to start fishing BTB (Beyond the Breakers). 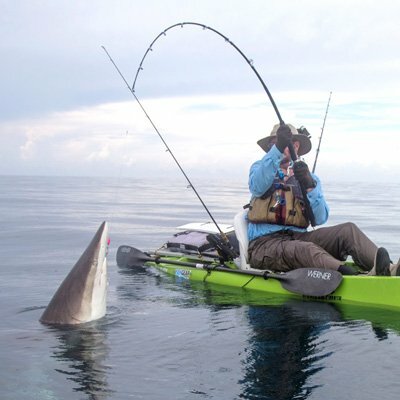 The more extreme version of Kayak fishing. 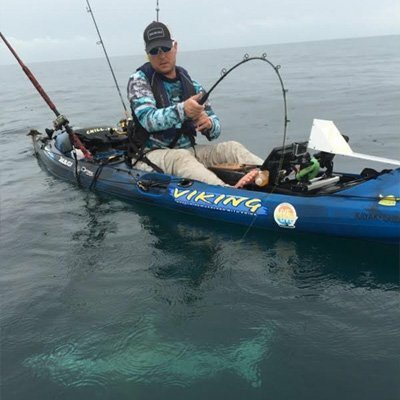 As a Pro-Staffer, Mike strives to help others into the sport of kayak fishing, teach the importance of safety and kayak rigging. Beginning as a teenager, Glenn spent 30 years fishing out of small powerboats offshore of Port Aransas chasing kingfish and cobia. He learned a lot about presentation and rigging ribbonfish in those years, and became “that guy” in charge of keeping all the tackle in order, rigging baits and keeping the spread of baits clean while we fished. Glenn also spent a lot of his earlier years wade fishing the bays for trout and reds, and even had the chance to crew on a big boat chasing (and catching) billfish, wahoo and tuna for several years. In 2007 Glenn got into kayaking after a traffic accident left him with a pretty serious neck injury. Kayaking helped Glenn strengthen his neck and shoulders, and see the offshore world in a whole new way. When he slowed down to kayak speeds, Glenn got a closer look at the fish and gained a better understanding of what it took to catch them. He started to think more like a fish, so he began to catch more and larger fish. He began carrying video cameras to prove to friends that his stories were true, and that launched what has become a pretty popular YouTube channel. Glenn post fishing trips, but also how-to videos to help new-comers learn to rig up and succeed when they head out to try kayak fishing for themselves. Kayaks have allowed Glenn to catch more fish, and have also allowed him to approach some that were unexpected. Glenn has been able to pet Manta rays much larger than his kayak, paddle with several types of sharks over 10 feet in length (no he didn’t pet any of those), and had lots of close-up contacts with the big porpoise that hang around the jetties of Port Aransas. Marshall’s love of the water started the day his grandpa took him crabbing which is one of his earliest memories. His dad took him surfing before he could swim and his uncles took him out on the boat for anything from laying net to spearfishing to offshore. Whipping small grubs on the shore catching the local Hawaii fish became one of his favorite things to do and that’s when he became addicted to the tug. 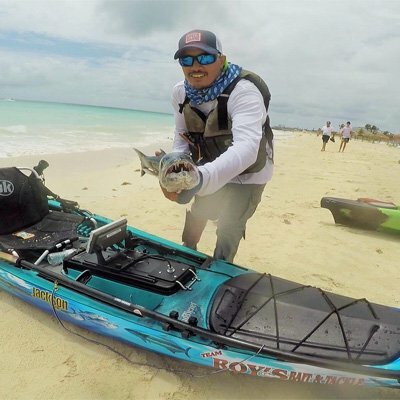 Marshalls kayak fishing started after watching Jim Sammons Kayak Fishing Show and after the inspiration to get back on the water a week later bought his first kayak a Pompano 120 from a guy named Fred who is now of his closest fishing buddies. Within a few days later caught his first red at Braunig Lake and looking to broaden his horizon led him to the coast. After learning the ins and outs of fishing inshore, BTB never came to mind until watching Professor Salts Youtube videos. After eyes wide open and the need for the BTB experience he met up with a good mentor and friend named Barret who showed him the ropes to fishing offshore in a kayak. His first experience offshore in a kayak was amazing. Crystal clear blue water at the MP rigs and the conditions were beautiful. Kings all day and every now and then he would notice a big dark something circling the rigs but never thought anything of it. Later he learned that fish was cobia and that ended up being his favorite fish to catch. Thanks to being friends with great fisherman who some shared their knowledge and countless hours on the water learning thru trial and error led him to his first great accomplishment… winning the 2017 Blue Water Kayak Classic Pt 1. He believes there’s more to putting fish on the stringer or in the bag, have respect for your fellow fisherman and have a good time and that’s what he says its all about. Marshall is willing to help out a fisherman with what he knows when it comes to equipment or fishing techniques so feel free to approach him in any way.